Saturday night we went and ran a local 5k and kids 1 mile fun run that benefited our local football team. It's always fun to run a race, but so much more when the family does it together! Lexi and I ran the 1 mile together. She has decided to train for a kids triathlon, so we are working on her mile pace. We did last night in 12.34. Given that it was past her bedtime, 90 degrees and at least 50% humidity, I think she did great! Kylie ran the first 100 yards with my sister and niece before she backed out. She's still thinking about this race stuff! Then after all of the 1 milers came in, we did the 5k. Maddie, Doug and I ran along with two of my sisters! It was so much fun! Here we are before the race. 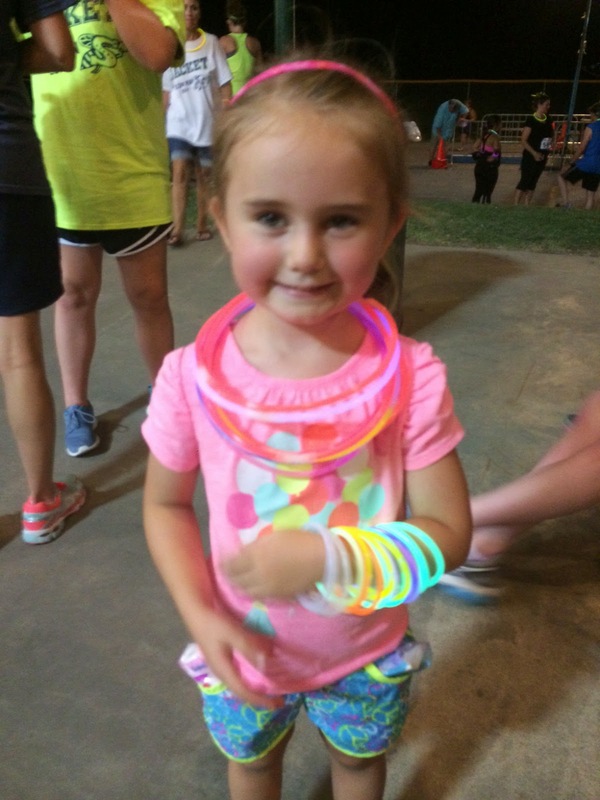 It was a "glow run" so we had lots and lots of glow bracelets and such! The race was fun. It was sooo hot and humid, but we live in Texas, so what can we expect in July! My sisters and I ran together and that was great. I felt really strong which was surprising as I had run 13 the day before. We ran my favorite 5k interval (4 min run/40 sec walk) and just kept moving through the night heat. Here Doug and I are after the race. I finished 3rd in the 40-49 age group. I have to say, I love medals! And here are a couple of my running buddies! Courtney (in the middle) won overall female and Kenya won 1st in our age group. I love running with fast women.. they motivate and inspire me!